Is your child struggling to form letters correctly? These letter formation tips and strategies may help! Why teach correct letter formations anyway? Why do some kids struggle so much? Why Teach Correct Letter Formations? Children should not be expected to “catch” writing skills (Graham, 1999, in Christensen, 2004) just from being given opportunities to play with pencil and paper activities – rather, they need to learn to master handwriting with very specific lessons! Learning to form letters correctly forms a big part of efficient handwriting. Kids who have not learned to form letters consistently correctly may be putting so much effort into remembering and writing the letters that they don't have the mental energy left for creative writing or correctly answering questions. This is why I feel it is important to teach correct letter formations from the very beginning. Once your child can write letters correctly, automatically, without thinking about them, he/she will be able to focus more on actually learning! 1) Shapes and patterns before letters and numbers! If your child has not yet mastered drawing shapes and patterns, then work on these first before attempting numbers and letters. Tracing and drawing shapes and patterns will help your child master the diagonals and curves necessary for letter formations. 2) The order of mastery is to first trace the letters, then to copy them, then to write them with a starting point cue, then to write them completely independently without cues. 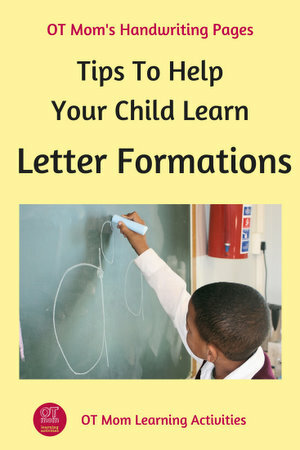 If your child can not yet copy a letter with the correct formation, then write the letter and have your child trace it. You may even find it helpful to guide your child’s hand as they trace the letter as in the picture above). Guiding your child's hand may help. 3) Start with the letters of your child’s name. So often, preschoolers learn to write their name by copying it any old how – and poor letter formation habits become deeply entrenched. Help your preschooler master the letters of their name correctly, and you will have laid a good foundation for learning the other letters. 4) Teach letters in families. Similarly formed letters can be taught together – for example c, d, o. Make use of a good handwriting program such as Handwriting Heroes or Handwriting Without Tears. 5) Make sure your child starts the letter or number in the correct place, and that he/she forms it correctly. Some kids are very good at getting their letter to LOOK correct, but their strokes were perhaps bottom to top, or right to left – so pay careful attention to HOW your child forms the letter, not just what it looks like at the end! 6) Use a multisensory approach. As well as the fun ideas on my letter formation activities page, try stories about each letter, rhymes or songs that will help your child remember where to start and stop each letter. 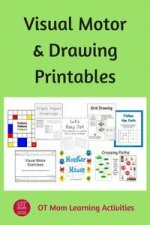 I used a program similar to Handwriting Heroes to help my kids remember the correct formations. South Africans may want to check out The Happy Handwriter for locally supplied resources. 7) Do letter formations as part of a gross motor activity. For example, have your child crawl, hop or jump to each letter and trace it, whether on a floor, a table or a wall. Learning to form letters and numbers involves a number of different foundation skills. Schickedanz (1999, in Dinehart, 2014) believes that children not only have to see the letter correctly reproduced in front of them, but they also need to recognize the line segments that form the letter and then have the ability to reproduce the sequence and direction of the segments that make up the letter. Good visual perception skills will enable your child be able to perceive the parts of the letter correctly (straight line, curves, diagonals). Good fine motor skills will enable your child to hold and control a pencil or crayon in order to replicate the letter efficiently. 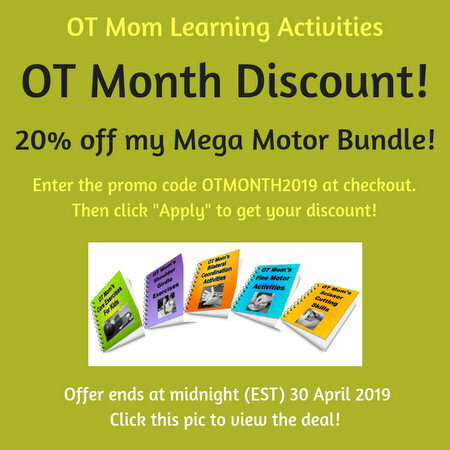 Good visual-motor integration skills will enable your child's visual system to guide the motor system in correctly forming and spacing the letter. So if your child struggles with any or all of these foundational areas, then he/she may struggle to form letters correctly. If your child is struggling to form recognizable numbers and letters, I really recommend you take a break from working on these, and work on some of the underlying foundational skills. This is particularly true if your child is still in preschool! There are lots of free activities on my site to help promote your child’s normal development. 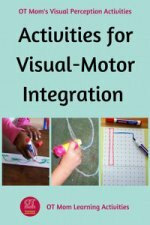 Visual-motor integration activities - a range of VMI activities for younger as well as older kids. 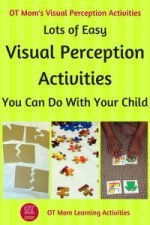 Visual motor worksheets - I prefer the hands-on activities above to improve visual motor skills, but sometimes worksheets have their place! If, however, you are concerned about your child’s development, please consult an occupational therapist for guidance! These letter formation tips are NOT a substitute for therapy! 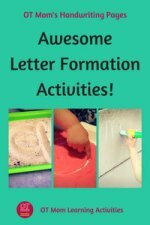 I hope you found these letter formation tips helpful! Why not sign up for my occasional newsletter to stay in touch with new activities and tips on my site?